Blog / FAQ / What is the Virtual Meter? 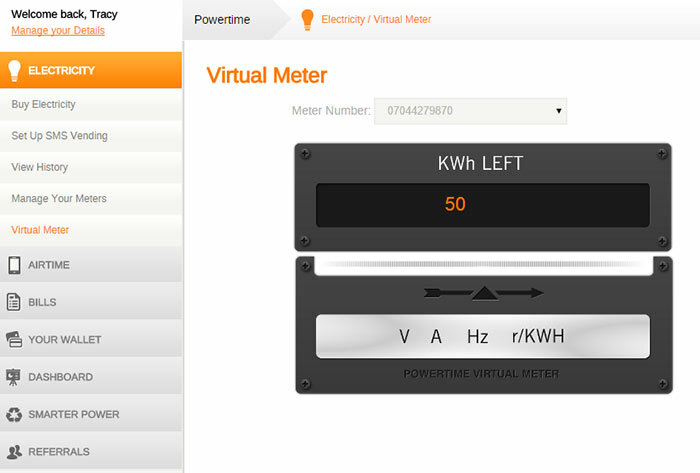 The virtual meter is an estimation of the credit left on your meter based on past purchases with Powertime. ϟ When running low on credit (by default 50 units), you will get a notification to remind you to top up. ϟ Change the amount on the virtual meter at any time. Note that the virtual meter updates are done at midnight every day, therefore your changes will only reflect on your virtual meter on the following day. ϟ By purchasing your electricity tokens exclusively via Powertime, you allow us to track your average consumption and provide you with a patented virtual meter that notifies you when your electricity credit is low.